Product prices and availability are accurate as of 2019-04-14 15:13:27 EDT and are subject to change. Any price and availability information displayed on http://www.amazon.com/ at the time of purchase will apply to the purchase of this product. Show your love of nature by purchasing clothing that help sustain the earth. This headband is pure stuff. Not as eco-friendly as it gets (wrapping bamboo leaves, anyone?) but on the right path. Definitely goes in the "did something right today" column, when you wear it. So why wait? 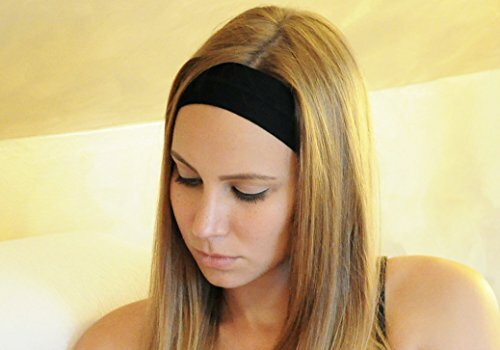 Get this all natural, soft, velvety headband. Feel good: bamboo is a sustainable fabric (organically grown, 100% biodegradable) that converts carbon dioxide into oxygen (improves air quality) and is drought tolerant (preserves water resources). Get the Mother Earth energy during your travels! Just as extra benefits, the headband wicks sweat to evaporate it, is lightweight and dries super quickly. Keeps your ears warm or cool based on your needs - the material helps your body cool or heat your head and keep you comfortable. ❤️ AMAZING FEATURES - Super soft, yet durable fabric. Elegant, stylish design to frame your face. Absorbs more than its weight: wicks sweat. Anti-stink: eliminates odors and prevents their formation. Thermo-regulating: keeps you cooler in summer, dry in humidity, warmer in winter. ❤️ BAMBOO MATERIAL BENEFITS - Hypoallergenic: perfect for sensitive skin. Antimicrobial, antibacterial, antifungal (prevents mildew formation) ❤️ BAMBOO PLANT BENEFITS - Organically grown, 100% biodegradable. Improves soil quality: no pesticides and fertilizers required. Converts carbon dioxide into oxygen and improves air quality. Drought tolerant, preserving water resources. ❤️ PURE PROMISE - Love it or send it back for a 100% refund. No reason needed. We're always here to help! ❤️ COST EFFECTIVE FOR GYM, WORK & PLAY - This headband performs its functions all at once. It's a superb investment in comfort, confidence and time management. The soft bamboo fabric keeps you dry and smelling nice. Time crunch? Skip the hair wash. Simply pull this stylish band over your hair - you'll look radiant and confident! The perfect time saver that'll keep your head feeling dry, composed and hugged all day. Wear it for your workout, to the office and to evening hangouts - all in one!